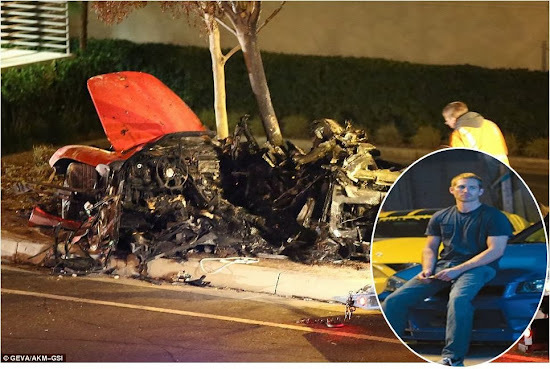 The accident happened in Santa Clarita -- north of Los Angeles -- and Paul was the passenger in the two-seater Porsche Carrera GT when the driver somehow lost control and slammed into a post or a tree ... and the car burst into flames. Several of our sources -- some of whom were at the scene of the accident -- tell us a friend of Paul's was driving and was also killed in the fiery wreck. Cops say speed clearly played a major factor in the accident, but an exact cause has not been determined yet. Paul was 40 years old. He leaves behind a 15-year-old daughter named Meadow. Paul's rep tells us he was in Santa Clarita for a car show -- organized by Paul and his charitable organization Reach Out Worldwide -- to support the Philippines typhoon relief effort. Several of his friends were attending the event ... which was very near to where the deadly accident happened. One of Paul's friends talked to a TMZ photographer ... describing the scene ... and his efforts to save Paul from the burning car. Paul took a pic with a fan at the event earlier on Saturday, and the guy posted it ... noting how happy Walker was just hours before the crash. The fan added, "The world lost an angel in Paul. He dedicated so much of his life to helping disadvantaged kids and people who are in need. I'm gonna do whatever I can to keep Paul's goals for the charity alive."